Here is a charming little problem to kick start your day. Lets say you run a cute little bakery around the corner. Since you want your prices to look charming, you have a policy to round them down or up based on below rule. If the price ends with 0, 1 or 2 cents, round it down to 9 cents. If the price ends with 3, 4 or 5 cents, round it up to 5 cents. If the price ends with 6, 7, 8 or 9 cents, round it up to 9 cents. So how do you round to nearest charmed price? You could do it manually. But you would rather bake a few more of those Tiny Cup Cakes than waste time rounding the prices. So you want an automatic way to round prices. This is where Excel helps. There are many ways to write a formula for this. Go ahead and take a hard look at it. Then we add or subtract few cents to get the charmed price with IF formula. IF the cents are between 3 & 5, we add 5 cents. Else, we add 9 cents. So for example, if the actual price is $2.37, the formula gives $2.39 thru below process. So we add 9 cents to the rounded down price. If the IF formula is too long & difficult to write, we can choose CHOOSE formula. This formula takes the price in C4 & adds or subtracts necessary cents to it to get the charmed price. We can simplify our CHOOSE formula with a mapping table. This formula is similar to CHOOSE formula. 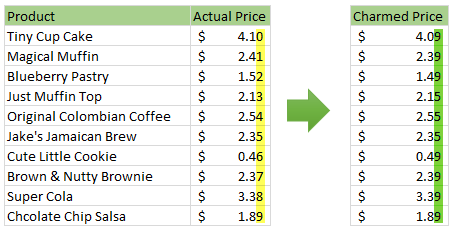 Using a combination of rounded down price & approximate lookup feature of VLOOKUP, we can come up with a smaller formula. Click here to download charmed price example workbook. Examine it to understand various formulas discussed in this article. Here is a challenge for you. Assuming the price is in C4, can you come up with another way to calculate charmed price? Please share your formulas in the comments section. Go ahead and charm us. Wouldn´t be possible also to use a boolean logic formula. Built similar to the if but just adding the data. Probably it would be the most efficient one. @Jay.. thanks for the comments. Excel has floating point error which can cause weird behavior when dealing with fractional arithmetic. I'd like to buy 10,000 Micro sampler cakes at the actual price of $0.02 each, please. Coooooeee, looks like you owe me $100! Thanks!